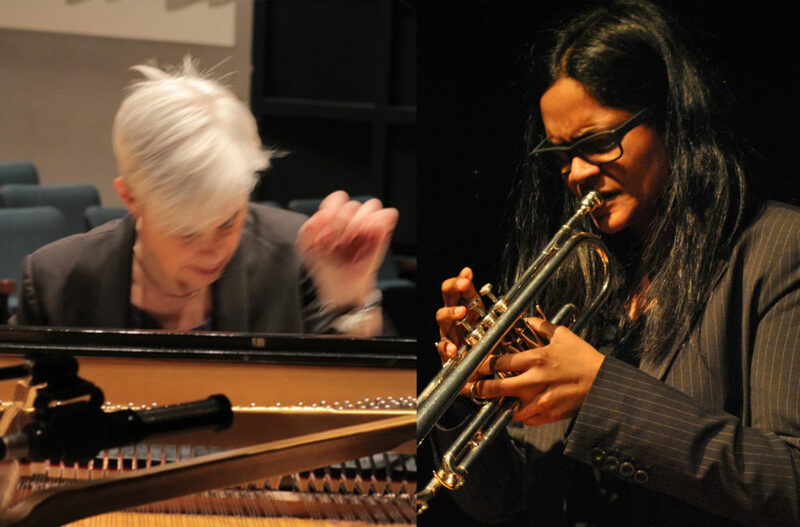 Pianist Marilyn Lerner is a friend of the Guelph Jazz Festival almost since its inception, having presented her Cuban-jazz inspired Birds Are Returning project back in 1997, with frequent visits including, notably, with her long-time collaborator Lori Freedman as Queen Mab. She is a remarkable improvising pianist, with an uncommon precision and care in pitch selection that contribute to an innate sense of structure, order, and development in her playing. Nicole Rampersaud is simply an extraordinary trumpet player, and without a doubt – as they say – a talent deserving wider recognition. With amazing facility and, especially, control of techniques that extend her instrument’s timbral range in astonishing ways, Rampersaud methodically constructs fascinating forms through improvisation. She has a thoroughly wrought solo practice, and plays regularly with c_RL (with Germaine Liu and Allison Cameron) and Brodie West’s Eucalyptus. Brass Knuckle Sandwich is a meeting of two of Canada’s finest improvisers, a simpatico pairing of imaginative, daring, patient, and generous music-makers.